This picture was a very strong contender for my wedding slideshow but in the end didn't make the final cut. 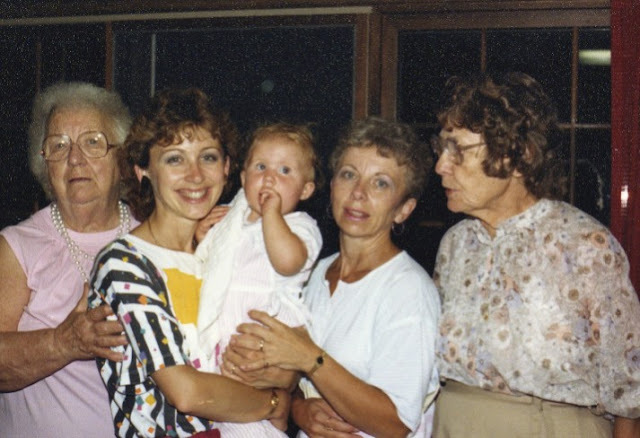 I think that was because my mom thought my grandma (we call her Nonnie [second from the right]) wouldn't be super happy with the confused/annoyed face she's making. But I think it's great. Four generations of woman from my mom's side. I have to wonder what was going on just before, or maybe as, this picture was taken. My mom is really the only one who looks ready. I suppose maybe that's the way of grandmas, though, isn't it? To took confused sometimes. Great-grandma Short looks like she might be looking at me, perhaps telling me to smile or look at the camera. Or maybe she's telling Nonnie something, which is why that look on Nonnie's could be a tad bit of irritation. I guess that's both the beauty and frustrations of photos. You can freeze a moment, yes, but you can't go back in time and recreate it. And it can leave you wondering what that moment actually was. I suppose I'll just have to wait for heaven so I can ask them. It's great that you have a picture like that, and your mom's shirt is rocking. I LOVE this photo! Because yeah, you know there was drama brewing. And you are cute a a button! Also, you're mom is probably like 10 years younger than I am right now. Sigh.